"I have said that in one respect my mind has changed during the last twenty or thirty years. Up to the age of thirty, or beyond it, poetry of many kinds, such as the works of Milton, Gray, Byron, Wordsworth, Coleridge, and Shelley, gave me great pleasure, and even as a schoolboy I took intense delight in Shakespeare, especially in the historical plays. I have also said that formerly pictures gave me considerable, and music very great delight. But now for many years I cannot endure to read a line of poetry: I have tried lately to read Shakespeare, and found it so intolerably dull that it nauseated me. I have also almost lost any taste for pictures or music." "On the favourable side of the balance, I think that I am superior to the common run of men in noticing things which easily escape attention, and in observing them carefully. My industry has been nearly as great as it could have been in the observation and collection of facts. What is far more important, my love of natural science has been steady and ardent. This pure love has, however, been much aided by the ambition to be esteemed by my fellow naturalists. From my early youth I have had the strongest desire to understand or explain whatever I observed,—that is, to group all facts under some general laws. These causes combined have given me the patience to reflect or ponder for any number of years over any unexplained problem." "My mind seems to have become a kind of machine for grinding general laws out of large collections of facts, but why this should have caused the atrophy of that part of the brain alone, on which the higher tastes depend, I cannot conceive." 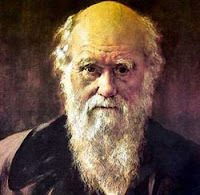 These quotes from Charles Darwin's autobiography illustrate the neuroplasticity of the human brain. During learning the brain constantly rewires itself. In this earlier post I wrote: "Our characteristics are less carved in stone than we tend to think. Dysfunctions are often less definitive than we have long thought. We can consciously keep on developing our brain and our functioning in general. And we do. Everything we do and think shapes how we further develop. Everytime we consciously focus our attention, we change structurally." One thing that is interesting about these Charles Darwin quotes is that they show the power of focused attention (Charles Darwin being one of the most influential thinkers of all time). The other thing that is interesting about it is that Darwin describes the use-it-or-lose-it aspect of mental abilities as well. He explicitly uses a muscle metaphor to the brain, by using the word 'atrophy', which current day many scientists do too. Here are some related posts: here, here, here, and here.